Hyun Bong-Hak, the late doctor and civic activist who saved thousands of civilians during the Korean War, was commemorated Monday with a statue in front of the Severance Building in central Seoul. Hyun has been dubbed “Korean Schindler” -- after German industrialist Oskar Schindler who saved over 1,000 Jewish lives during the Holocaust -- here for persuading US military officials during the war to evacuate some 104,000 refugees from battlefields in Heungnam, North Korea. The Ministry of Patriots and Veterans Affairs in 2014 designated him as a Korean War hero, making the late physician the first civilian to receive the honors. “Dr. Hyun’s efforts to evacuate the refugees helped save more lives than Schindler himself, while protecting the value of freedom... I hope those who pass by his statue will think about the tragedy of (Korean) people and aspire for the reunification of Koreas,” said Kim Yong-hak, the president of Hyun’s alma mater Yonsei University. Born in 1922 during Japan’s colonization of Korea, Hyun’s crowning achievement came in December of 1950 when the embattled soldiers of South Korea and UN troops were pulling out of Heungnam. While no ships were originally allocated to carry thousands of North Korean civilians, Hyun -- a ROK Marine Corps’ interpreter at the time -- pleaded for two weeks to the military officials by saying that leaving them behind would put their lives in peril. Hyun’s plea eventually moved the US officials, including Gen. Almond, the commanding general of the X Corps., US Army and Col. Edward H. Forney of the US Marine Corp. who was the X Corps’ evacuation officer. Hundreds of tons of war supplies were removed from US vessels and civilians were led to new lives in the freedom of South Korea, Moon Jae-in’s parents being among them. Moon Jae-in, an opposition presidential hopeful, said he would not even be born if it were not for Hyun, as his parents were among the refugees who narrowly escaped the communist soldiers at the evacuation. “I hope the unveiling of the statue would offer a chance for us to learn about the doctor’s humanity, love for his country and his people, along with his spirit to pursue reconciliation and cooperation between South and North Korea,” he said, expressing regrets about the current inter-Korea tensions. But Hyun himself was humble about his achievements, even blaming himself for possibly causing a million people to be separated from their families. He devoted his life to practicing medicine and commemorating those who fought Japanese colonialism, until his death in 2007. While working in China, he helped find and decorate the grave of Korean poet and freedom fighter Yun Dong-ju, which had been left abandoned. US ambassador to South Korea Mark Lippert stressed that Hyun’s legacy is lasting through the generations of families he has saved. Not only was the SS Meredith Victory used to save lives, some literally started aboard the cargo freighter. 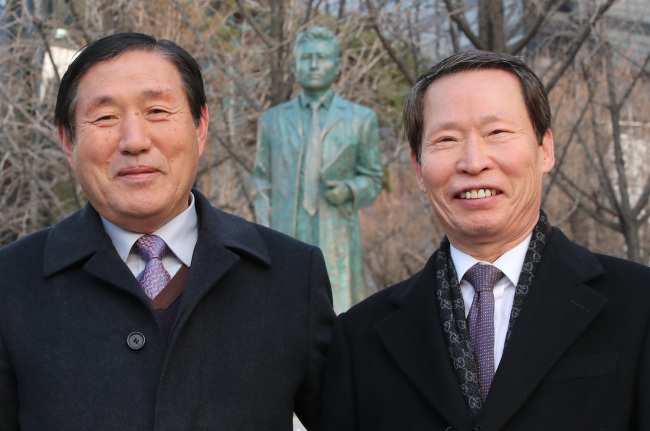 Son Yang-yang and Lee Gyeong-pil, two who were born on the ship during the Dec.15-24 evacuation, also witnessed the unveiling of the statue. Son was also an alumni of Yonsei, just like Hyun. “If I had known before (about Hyun), I would have visited him and offered my gratitude...I will never forget him,” Son said. “One of my father’s greatest hopes was that future generations would remember Heungnam Evacuation and the Korean War. His wishes have been largely fulfilled,” she said. On her father’s behalf, she received the Certificate of Person of Distinguished Services to the State from the Ministry of Patriots and Veteran Affairs. The ROK Marine Corp presented Order of National Security Merit Tongil Medal and Certificate Core Values of the ROKMC to Hyun. Ned Forney, the grandson of Col. Edward H. Forney, wrote in his column that the statue will be both a memorial for Hyun’s actions and a tribute to refugees who risked their lives to escape the communist North Korea. “Most importantly, however, it will be a reminder to all Koreans that one man can make a difference,” he wrote. The event was co-hosted by the Yonsei University Health System, Ministry of Patriots and Veterans Affairs, and Republic of Korea Marine Corps. It was jointly funded by the state, Yonsei, and donations from citizens.